The first Crusade was a thousand years ago when Pope Urban II marched his Christian Army across Europe slaughtering every Jew in his way to reclaim the Holy Land from Islam until the Christian soldiers stood knee deep in Muslim blood in Jerusalem. In 2003 President George Bush publicly declared another Christian Crusade. President George Bush subsequently conquered Muslim Afghanistan, Muslim Iraq and is now preparing to nuclear conquer Muslim Iran. Fortunately, a few days ago on Sunday October 21, 2007 Pope Benedict XVI and the Archbishop of Canterbury, Dr. Rowan Williams, the head of the Church of England and the World Wide Anglican Church officially cancelled George Bush’s Christian Crusade, which is good since the last Crusades lasted for 200 years. This past Sunday October 21, 2007 the world’s religious leaders convened in Naples to bring everlasting peace to earth. Pope Benedict XVI hugged the Archbishop of Canterbury and then they sat down for lunch with the Chief Rabbi of Jerusalem Yona Metzger and the Iranian Ayatollah Sayed Mohammed Mousavi Bojnourdi. Prior to lunch, Pope Benedict XVI gave the most historic Christian speech since Jesus Christ’s Sermon on the Mount. Like Barack Obama, Pope John Paul II was a vigorous opponent of the invasion of Iraq in 2003 by the United States. So too was Pope Benedict XVI, who at the time was German Cardinal Joseph Ratzinger. One billion Muslims including the nuclear armed ones in Pakistan know that they are being massacred by the American Christian Crusader George Bush, and are screaming, “Death to the Crusaders”, “Death to America”. The Muslims in Iran have now formed a strategic military alliance with Russia and China, who combined to defeat the United States in Vietnam, in order to defend themselves from the Crusader in Chief. Prior to lunch this past Sunday in Naples, Pope Benedict addressed 200 of the world wide Christian, Muslim, Jewish, Zoroastrian and Buddhist religious leaders and said, “In a world wounded by conflicts, where violence is justified in God’s name, it’s important to repeat that religion can never become a vehicle of hatred. Religion can never be used in God’s name to justify violence. In simple terms Pope Benedict XVI cancelled Christian Crusades for Christ permanently. The 138 Shiite, Sunni and Sufi Muslim scholars, religious and political leaders from every country on earth sent this letter, an olive branch of peace from 99.9 % of Islam to the Christian world, asking for Islam and Christianity to unite under God of Mount Sinai aka God the Father, Jesus Christ, (the prophet and Messiah of Islam), the Holy Spirit, Allah, Elohim, and Yehovah, and their common belief in “Love your neigbour as you love yourself” from the Hebrew Old Testament. The Muslim scholars’ 29 page letter was enthusiastically received by the Archbishop of Canterbury, the Head of the Church of England and the World Wide Anglican Church, Dr. Rowan Williams, who said, “Love of God and Love of neighbor are scriptural foundations for Jews, Christians and Muslims and are the basis for justice and peace in the world. The United States claims to have separated Church and State. Where does it come to an American President to declare a Crusade on behalf of Christianity? George Bush claims to be a Methodist. John Wesley invented the Methodist religion a couple of centuries ago, in the 1740’s. John Wesley himself said that he always remained within the Church of England and insisted that his movement was well within the bounds of the Anglican Church. If George Bush is invoking the name of Jesus Christ and the Anglican Church to Crusade against Islam, then he has now put himself under the jurisdiction of Dr. Rowan Williams, who has now officially called for peace with Islam. If George Bush is saying that he is fighting Islam on behalf of Jesus Christ, then which Jesus Christ is George Bush speaking about? The American colony of Iraq is the next door neighbor of Iran. George Bush is leading the world into the Apocalypse because he read in the book of Revelations that during the Apocalypse, Jesus Christ will descend from Heaven on his flying horse and defeat the snake, goat, lion Beast, Devil. What all Bible Scholars on earth know today is that the New Testament was written in Greek by Greek authors and that the Prince Jesus flying horse story is a dead on plagiarism by John Patmos of the Greek Myth of Prince Bellerophon on his flying horse Pegasus defeating the snake, goat, lion Chimera. 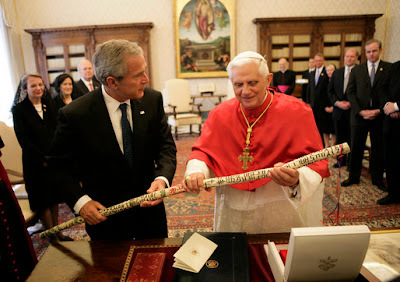 Therefore President Bush is not following Peter, the Apostle who Jesus Christ built his Church upon, aka Pope Benedict XVI, or the Anglican Church, or John Wesley, or Jesus Christ. In fact, George Bush is following the Greek and Roman God of War, Ares, aka Mars. The men in the White House are from Mars.